The first trial accusing Olympus Corp. of wrongdoing associated with contaminated duodenoscopes in US hospitals is underway. The case surrounds the death of Richard Bigler, a 57 year-old patient who underwent a scope procedure while battling pancreatic cancer in 2013. It’s alleged that during the procedure, a tainted duodenoscope at Virginia Mason Medical Center passed on a drug-resistant infection that led to his rapid decline and eventual death. “Other documents released at the trial show that Olympus received a complaint from Virginia Mason as early as January 2011 about “patient debris” trapped inside the tip of the scope that was “extremely difficult” to remove. During the trial, a company official said there was no evidence of infection or other devices becoming contaminated so Olympus didn’t report the matter to federal regulators. [Olympus executive Susumu] Nishina disputed many of the expert’s findings in his own 2012 report, released publicly for the first time as evidence in this case. The Olympus executive said the engineer’s report includes “many unscientific views, and isn’t valuable to be trusted.” Nishina said the expert has a “prejudiced imagination” and “the endoscope has been confirmed to be sufficiently reprocessable following the instruction manual,” according to the report. For Olympus’ defense, they have alleged that staff at Virginia Mason Medical Center did not follow the company’s cleaning instructions and are responsible for the outbreak. For all US hospitals, this becomes a huge potential concern. 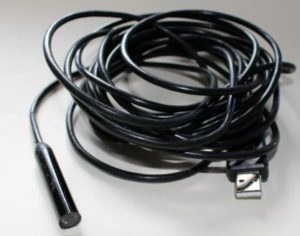 If a hospital becomes the site of an endoscope-related outbreak, scope manufacturers will most likely point the blame at the hospital for being the cause of the outbreak. This puts the onus on the hospital to prove that their processes and procedures were of a sufficient standard to avoid the blame falling solely upon them. In such a case, documentation of rigorously followed procedures will become a must have for the hospital’s defense. Automated documentation systems such as iRIScope can make the capture and reproduction of such documentation seamless, and reduce the amount of time sterile processing staff spend documenting their work. 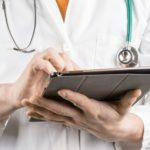 This documentation can be the difference between successfully defending hospital staff in court and severely damaging a hospital’s reputation by losing a lawsuit related to patient safety. All successful endoscopy practices within private practices and hospitals face the same dilemma – how do I track down scopes that have gone missing? With numerous docs, interns, techs and nurses all having access to all the scopes in your facility, it’s a near impossibility to keep track of all of your scopes with 100% accuracy. The typical way a hospital tracks the whereabouts of their endoscopes is to have staff fill in paper logs verifying that they have taken scopes out for their procedures. In our experience, the process breaks down in at least 20% of transactions, where the employee taking out a scope doesn’t sign it out in a log book. With the system being voluntary and not closely policed, scopes will “walk away” from time to time, and these are medical instruments costing from $10,000-$80,000 each. Typically, this information is found out 3-5 days after the scope has originally gone missing. Because no information was entered into the log book, everyone must be interrogated about the last known whereabouts of the scope. When everyone is on the hook, no one is on the hook and the culprit can be very hard to pinpoint. Usually the scope turns up several days later, but in the meantime the department has lost several days of revenue from proper utilization of the scope. And occasionally, the scope won’t turn up and a new scope will have to be purchased to replace it. So what can a manager of a perioperative or GI area do in this situation? Systems such as iRIScope from Mobile Aspects have been introduced in the last several years to take manual processes for endoscope management and turn them into electronic records. Using RFID technology, you can now literally have your scopes alert you when they’ve gone missing. The way RFID technology helps automate endoscope management is both simple and highly effective. Attaching medical-grade RFID tags to your endoscopes allows each scope to be tracked electronically as it goes through its normal usage lifecycle. Because you now have an electronic time stamp of each scope’s last known whereabouts, intelligent analytics built into iRIScope will push missing endoscope alerts right to your inbox. Built-in analytics allow iRIScope to measure each of your scopes against a time threshold that you set – 12 hours, 24 hours, 48 hours, etc. – and alerts for scopes that have been missing for longer than the allotted threshold are delivered directly to your inbox. The alerts delivered to your email give you a head start on locating those missing scopes. The system lets you know the last employee to touch the scope, when it was last touched and where it was last touched. While the software can’t literally tell you where the scope is, it can do 95% of the investigative work for you and significantly reduce the likelihood that the scope has permanently gone missing. There has been a lot of discussion lately about the number of days a flexible endoscope can safely be in storage before another cleaning is required. Different medical societies like SGNA, ASGE, AORN and APIC have come out with guidance on what the appropriate hang-time limits are. Some hospitals that we’ve talked to have listened to the guidance and set hang-time limits ranging from 7 to 30 days, with many landing right in the middle at 2 weeks. Other hospitals haven’t set a limit, pointing to studies showing that there is no evidence a re-cleaning is required after 30 days and trusting that their scopes will get washed with regularity anyway during the normal course of business. While the number of days between re-washes is being debated, staff are still stuck with the laborious task of making sure all of their scopes are re-washed within their hospital’s designated limit. Placing paper tags on their scope that list the last date of re-wash and/or the date of the next required re-wash.
Keeping a log book that shows the last re-wash date of all the scopes under management. The potential issues that these tracking methods present are numerous. 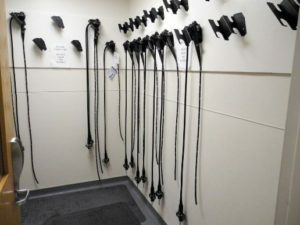 Having staff roaming the halls daily to check all the tags on each of your endoscopes seems to be the standard way hospitals monitor their endoscopes to see if they’ve reached their storage limit. Just 10 to 15 minutes spent doing this per day is the equivalent of 1-1.5 weeks spent per year monitoring this information. This is a conservative estimate, which will significantly underestimate the time needed for larger medical centers that have scopes distributed across multiple departments, floors and buildings. This makes the cost of manually tracking scope hang time head in to the tens of thousands of dollars per year. The minute you attach a paper tag to a reprocessed scope, you are putting a non-sterile object on your high-level disinfected or sterilized scope. Whenever someone checks a tag, they put their hands on the tag, and that tag in turn touches your scope. Whatever germs that were on the employee’s hand may have transferred on to the supposedly disinfected scope, so the risks are self-evident. We have heard stories about surveyors from agencies like TJC who have had issues with these manual methods of tracking endoscope hang time. They point to 2 main reasons why these methods are sub-optimal: a) they require a paper trail, while many surveyors prefer electronic logs and b) they introduce a potentially non-sterile component to your HLD endoscopes. With both the paper tag and log book methods, you are expecting your staff to make quick calculations on the fly. While it may seem simple in principle to add 7, 14 or 30 days to today’s date, in the real-world staff are making those quick calculations while trying to balance their other tasks and being pulled in several directions simultaneously. Occasionally mistakes will be made and that’s just not good enough when it comes to patient safety. Systems such as iRIScope from Mobile Aspects have been introduced in the last several years to take manual documentation for endoscope management and turn them into electronic records. Using RFID technology, you can now literally have your scopes alert you when they need to be re-washed. The way RFID technology helps automate endoscope management is both simple and highly effective. Attaching medical-grade RFID tags to your endoscopes allows each scope to be tracked electronically as it goes through the HLD process. Because you now have an electronic time stamp of each scope’s most recent wash stored in a database, intelligent analytics built into iRIScope will push endoscope re-wash alerts right to your inbox. No more log books, no more paper tags – just electronic documentation that makes your department more effective and more efficient. All the time staff spends looking at paper tags to see which scopes need to be washed is now turned into time spent on patient care. All potential for human error in miscalculating the re-wash limits have now been eliminated. And patient safety and accreditation likelihood have improved because your disinfected scopes are less prone to contamination. A recent incident in the Philadelphia area reminds us of the dangers that can result from improperly trained staff in the endoscopy area of a hospital. In the incident, an elderly patient undergoing a surgical procedure had an improperly cleaned endoscope used on them during their procedure. “The Crozer investigation noted that the hospital’s endoscopy suite was closed for the weekend when the incident occurred on Saturday, Jan. 7. 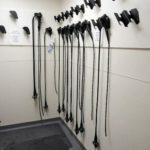 A Pennsylvania Health Department inspector’s interview determined that an employee involved with the surgery “did not know that an endoscope could not be reused if it had only been pre-cleaned and did not understand that it required high level disinfection before reuse,” according to the investigative report, which determined that the hospital had failed to follow its own policies. While it is certainly admirable that Crozer-Chester volunteered the incident to the State before any others occurred, it is clear from the employee’s interview that the procedure breach was entirely preventable. In order to reduce the risk of these types of incidents from occurring, hospitals must be more proactive in educating their staff about the risks of hospital acquired infections and how to prevent them. In the endoscopy suite of a hospital, this education must be an even higher priority due to the nature of flexible endoscopes and their susceptibility to spreading diseases. It should be noted that Crozer-Chester did re-educate and re-certify its staff after the incident, but it is a case of too little, too late. Recently, the Joint Commission (TJC) released its recommendations on how to create a culture of safety within healthcare organizations. As hospitals work to create safer environments for their staff and patients, a culture of safety has become tantamount to reaching their operational goals. A culture of safety can have several positive effects at a healthcare facility: safer patients, happier staff, reduced outbreaks of hospital acquired infections (HAIs), and improved employee retention for starters. 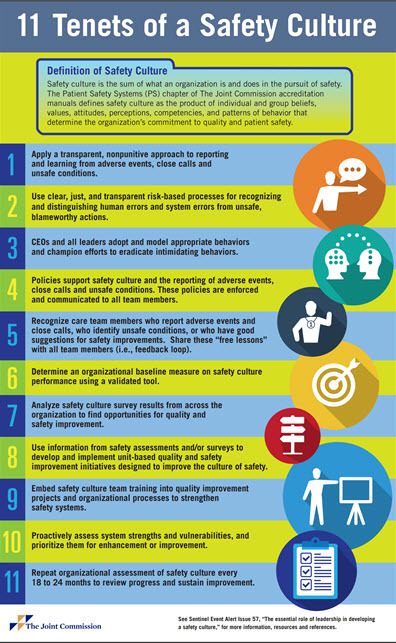 If your hospital is pursuing higher standards of safety in the workplace, TJC’s 11 tenets provide a great reference point. Your hospital must enable its staff to have input into the ever-changing processes that ensure the highest levels of safety. Not only will this enhance your hospital’s culture of safety, it will also lead to increased employee satisfaction. According to TJC, you must also allow your staff to pursue higher levels of safety through improved tools, organizational processes and safety systems. Consider a system such as iRIScope that helps to improve processes for managing your endoscopes by increasing the transparency of data within your organization. Systems like these show your staff that you are invested in your culture of safety and also arm your staff with the data and analytics to appropriately run their departments. Hospital Acquired Infections (HAIs) continue to be a focus area for hospital departments such as infection control and sterile processing departments. Infection control has been a key area of focus by many US hospitals due to the huge financial and reputational risk that exists when an outbreak of a superbug occurs in a hospital. Biomedical engineers can also take a role in the fight against HAIs by helping to design and enforce the processes around medical equipment usage, cleaning and maintenance. “Joe Lewelling, vice president of emerging technologies and health IT at AAMI, reports that health technology management (HTM) professionals can—and should be—key stakeholders in these efforts. While HAIs are a “system issue,” the importance of HTM input and involvement has been somewhat overlooked. In order to fight HAIs and their effect on patient safety and hospital operations, biomed can take a more proactive role. By keeping instructions for use for hospital equipment updated, and ensuring that staff are adhering to them, a lot of potential HAIs can be averted. Additionally, biomed can help design and enforce the processes and systems their hospital uses to prevent HAIs. One system that biomedical engineers should consider is iRIScope, which helps to improve processes for managing your facility’s endoscopes by increasing data transparency within your organization. If endoscope management is a potential area of risk for your facility, request this free Scope Accountability checklist to determine how prepared your hospital is for your next Joint Commission and state Department of Health visits. Hospitals continue to pursue patient safety initiatives as part of the overall shift in US Healthcare from volume to value. After all, hospital acquired infections (HAIs) quickly increase the cost of a procedure and will directly affect your bottom-line. This is on top of any damage to your hospital’s reputation that may occur from an outbreak, which could quickly mount to millions in lost business beyond the effected procedure. “Proactive rather than reactive safety management. Clinicians to investigate errors “to understand how things usually go right as a basis for explaining how things occasionally go wrong. A shift in attitude “From fear, blame and liability to humility, trust, transparency. With so many areas for hospitals to focus their patient safety initiatives on, how do you even get started? Start by reviewing your hospital’s HAI history to see if there are any common problems that emerge. Within that list, see if there are any HAIs that can be fixed with process introductions or upgrades so you can pick off some “low-hanging fruit.” Being proactive about fixing those common problems can lead to outsized gains by your organization. If you also want to put in a system of “humility, trust, transparency”, as the article suggests, consider a system such as iRIScope that helps to improve processes for managing your endoscopes by increasing the transparency within your organization.